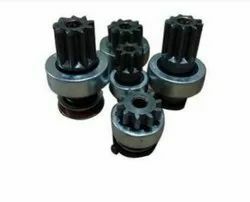 manufacturer of drive assmeblies replaceable for elmot, zetor t-25, ursus etc. To meet the variegated demands of the clients, our company is instrumental in offering an excellent quality range of Three Wheeler Bendix. With very long years of experience in this realm, we are best in tendering world class array of Self Bendix Drive. They are designed by our engineers with the use of best tools and skills. DRIVE / BENDEX relies on the principle of inertia to cause the pinion gear to mesh with the ring gear. When the starting motor is not operating, the pinion gear is out of mesh and entirely away from the ring gear. When the ignition switch is engaged, the total battery voltage is applied to the starting motor, and the armature immediately starts to rotate at high speed. We are engaged in manufacturing, supplying a fabulous range of Starter Motor for Lucas and varroc models that is made in our hi-tech facilities and with the help of latest machines. These are tailor-made o suit the clients’ specifications and are offered at competitive prices.